Over the years, many IPAs have been described as "dank", "resinous", "sticky", 'weedy' and plenty of other marijuana-related terms. Hop cones look a little bit like buds and hop leaves can look similar to pot leaves if you squint hard enough. And, since researchers have discovered that hops and marijuana are both in the cannabaceae family, this isn’t really surprising. They’re cousins. The fact they share some traits makes a lot of sense. But sometimes you need to throw loose connections to the side and knock the subtleties away with a sledgehammer, as Aether Brewing did when they straight up brewed a Hemp Infused Double IPA. 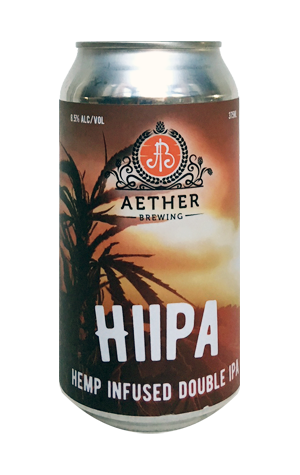 Aether originally brewed HIIPA in collaboration with Bloodhound Bar for Brewsvegas 2018, but have since canned it as their 2018 autumn seasonal release. It’s a hazy brew, but one whiff will tell you this isn’t a New England IPA. It smells as you’d expect – sweet and sticky, dank and resinous. And it drinks much the same, with a slightly oily mouthfeel bringing earthiness, apricot notes, and a little bit of grass (no pun intended). The bitterness is low for a IIPA, and it’s super smooth for something so potent. And before you ask – no, it won’t make you high.